Aries Pro Series Grille Guards are packed with a pile of great features in addition all the great benefits of having a grille guard on your truck. 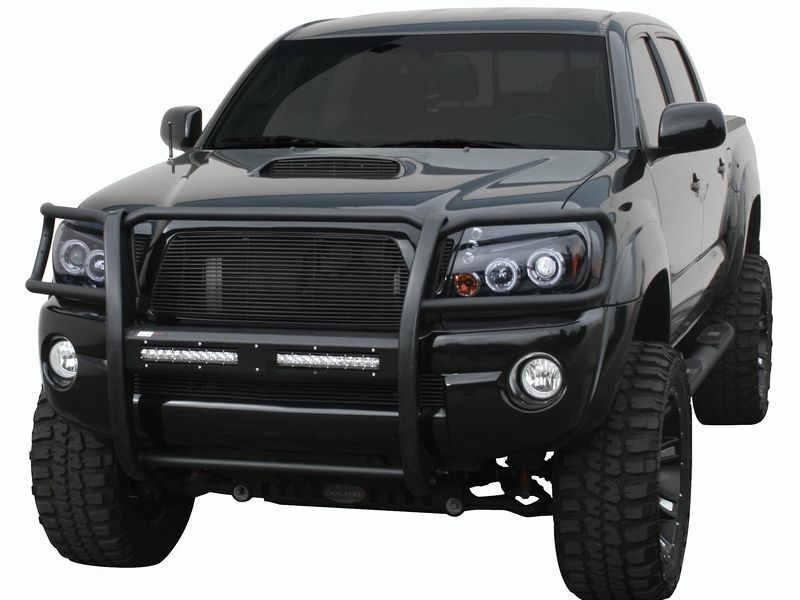 The Aries Pro Series grille guard / brush guard definitely will protect and enhance the front end of your pickup truck. It is a solid, welded one-piece design and features a no drill installation. What sets the Pro Series grille guard apart is it comes with a center mesh cover plate. You can install up to a 30" wide led light bar behind it (20" for the Jeep Wrangler). There is also a nice selection of optional cover plates you can get in stainless or black than feature either an open face or mesh face. The cover plates come in 2 styles, one style is made for two, up to 10" wide led light bars and the others are designs for 20" or 30" led light bars. In addition to that you can also a rotating cross bar that can accommodate most LED light bars on the market that allows you to angle the Lights exactly where you want them aimed. These system added style and protects your LEDs from the elements and theft. Aries pro guards are 1/4" think plate & mandrel bent 1-1/2" carbon steel tubing. Finished with a distinctive, durable textured black finish. The sharp design is made specific from each vehicle, so it nicely compliments the lines of your truck or Jeep while easily integrating with your factory bumper. Upgrade your pickup today with Aries. Aries pro series grille guards are installed but bolting onto the frame of your vehicle. No drilling is needed. It is designed to install and work inconjuction with your factory bumper.